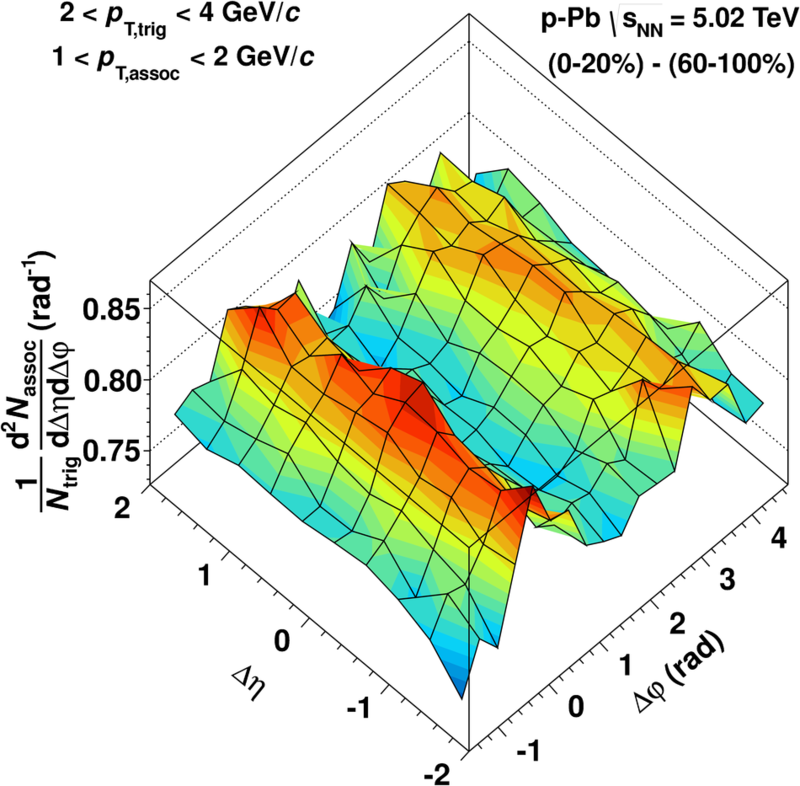 The analysis of the data from proton-lead collisions at the LHC led to a surprising observation in the way that particles emerge from the high-energy collisions: it revealed a completely unexpected double-ridge structure with so far unknown origin. 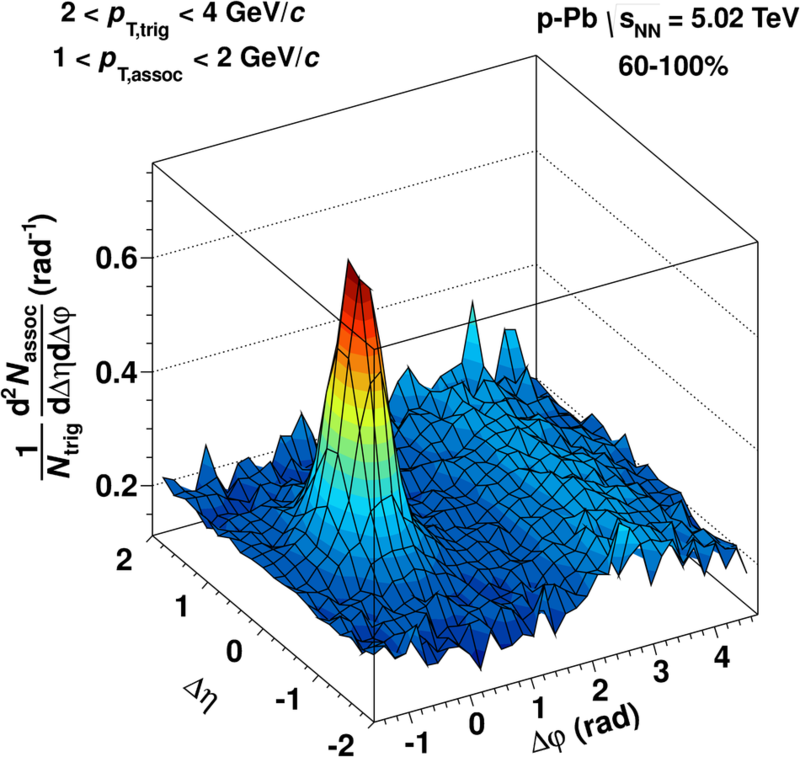 The analysis performed by the ALICE collaboration characterizes two-particle angular correlations as a function of the number of particles produced in the event, as measured by forward scintillator detectors (‘event activity’). The correlations are determined by counting the number of associated particles as a function of their difference in azimuthal angle (Δφ) and pseudorapidity (Δη) with respect to a so-called trigger particle in a given transverse momentum range. On the "near side" (Δφ≈0), the separation of an Δη-elongated ridge structure from the contribution of a jet to the correlation is straightforward because the jet peak is concentrated around Δη= 0. It is more difficult on the "away side" (Δφ≈π) because both structures are elongated in Δη and not easily separable by selecting on Δη. Experimentally, however, the near-side jet peak shows only a weak dependence on the event multiplicity. So by subtracting the correlations at different event multiplicities from one another, it is possible to remove the jet-like contribution of the correlation to a large extent and to quantify modifications as a function of event multiplicity. The first figure shows the two-particle correlation of high-multiplicity events and the second that of low-multiplicity events; the third figure shows the two-particle correlation of low-multiplicity events subtracted from that of high-multiplicity events. A clear correlated excess is found, which forms two ridges along Δη. This technique allows to see not only the near side ridge, but also the away-side ridge, which is of similar magnitude. 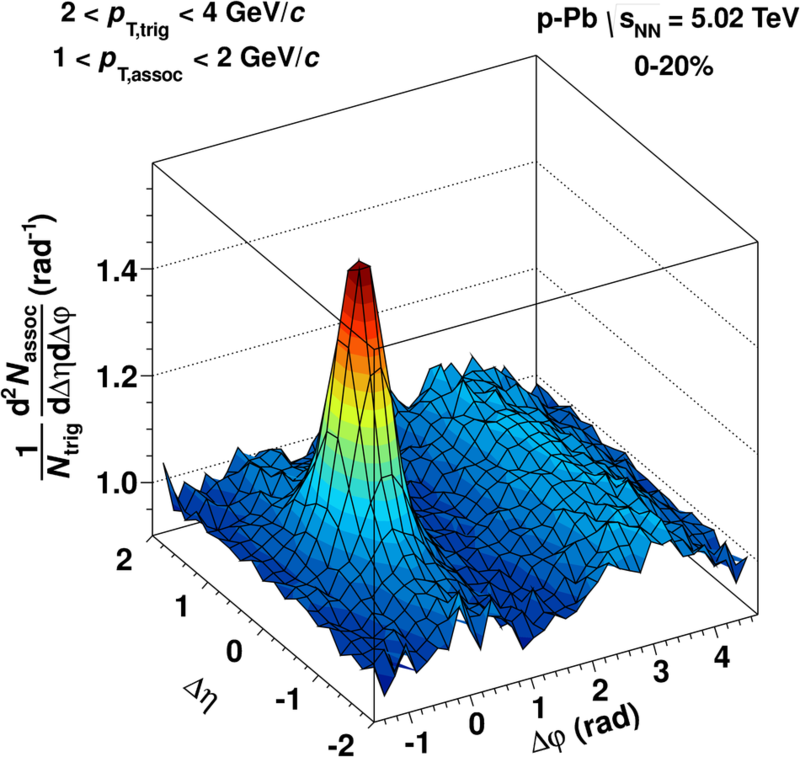 The same type of double-ridge structure has been observed in collisions of heavy ions, in which we a quark-gluon plasma is formed that behaves like a liquid: pressure gradients in the initial system are transformed in collective flow. However, the size of the collision system is much smaller in proton–lead collisions and we do not expect that there are enough secondary interactions to build up a flow effect. This intriguing and unexpected result still needs to be explained theoretically. Models that produce almost identical near- and away-side ridges are based on the colour-glass condensate framework or on hydrodynamical calculations that assume collective effects to occur also in proton–lead collisions. Whatever the origin may be, this observation has opened the window on a novel phenomenon.